Back in November, Seahawks corners Brandon Browner and Richard Sherman—the league's best tandem, until Darrelle Revis's ACL heals—both tested positive for performance-enhancing drugs (reportedly Adderall) and faced four-game suspensions. Browner decided not to appeal, and his suspension will conclude this week. Sherman did appeal, though, and at his hearing last week he argued that proper testing procedure had not been followed. According to Adam Schefter, a leaky sample cup played a large role. 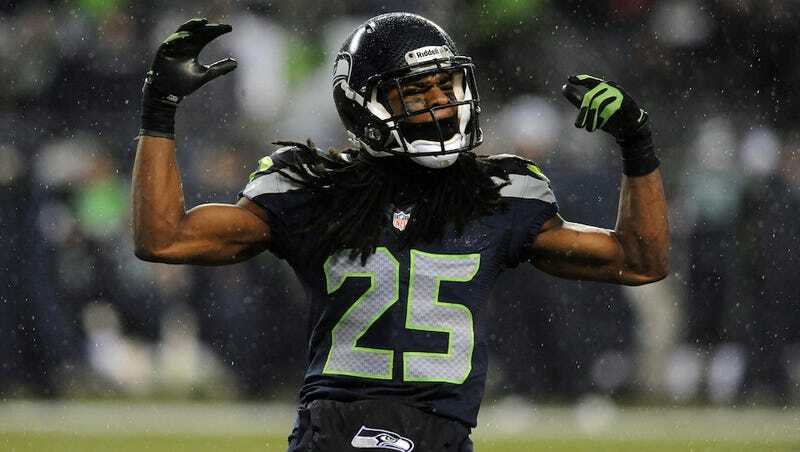 The NFL ruled on Sherman's appeal today. How'd he do? Well then. Seattle plays St. Louis on Sunday with a chance to clinch the division, should the Niners lose, and a first-round bye, if both San Francisco and Green Bay stumble. Having Sherman around will help them beat the Rams, to be sure. But today's ruling has far more bearing on what comes after that: Seattle will now have a fully intact Legion of Boom for its first playoff game. So long as the backbone of the Seahawks' surprising, elite defense stays strong, it's hard to imagine anyone beating them.